My phone is always with me. I use it for work to check emails, post status updates and also for personal use. Hello Candy Crush (I’m on level 400!). With the holidays here, I’m looking forward to some time away from my phone. Entering Holiday Mode will likely be a challenge for me since it’s become second nature to always be checking my phone and chatting with my friends on Facebook. However, I know this time away will be good for me. I’ve been working really hard this past month so that I can enjoy some time off. I’m excited to spend some face-to-face time with my family and friends. The emails and Candy Crush will be there when I get back. This holiday season, TELUS is inviting Canadians to enter Holiday Mode by unplugging your devices and celebrating togetherness with your loved ones. This is the time of year precious memories are made so live in the present! TELUS has a video featuring a foodie photographer and her husband sitting down for a holiday meal. Of course, the foodie photographer must photograph her dinner and get the perfect shot. That is totally me! Her husband’s annoyed expression is priceless and this is just one scenario of how to enter holiday mode. Not only are our devices constantly interrupting our time with family and friends, but they are also a source of stress. Unplug this holiday season and RELAX – the emails and social media can wait! A recent TELUS survey discovered that Canadians are twice as likely to be on their phones around family and friends (82.6%) than they are at work (40.6%). Put the phone away and focus on the human connection. 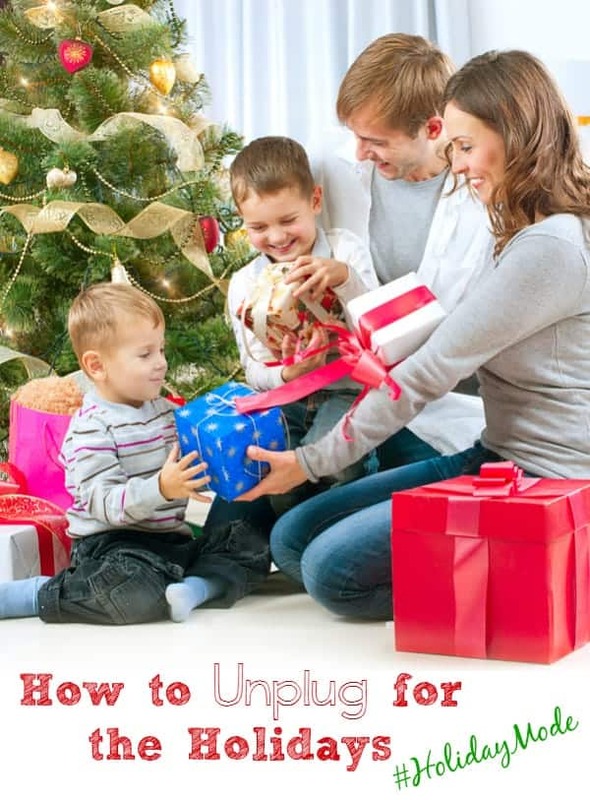 TELUS and family expert Sharon Vinderine has some Holiday Mode tips to help you unplug and spend time with those who matter most, your family and friends. 1. Take baby steps and start now. You don’t need to do it cold turkey. To avoid device withdrawal, begin setting small goals for yourself like committing to putting your smartphone on silent over dinnertime. If you can get through dinner without checking your phone, you’ll find entering Holiday Mode far less of a challenge. 2. Make a public declaration online #HolidayMode: Tell your friends and followers online that you will be unplugging and going into #HolidayMode for a bit. Ask them to call you on it if you suddenly start commenting on their posts or sharing pictures of your beautiful holiday dinner. 3. Adjust your notification settings: Turn off push notifications on your devices and apps to stop them from tempting you every time a text message comes in or a friend tags you on Instagram. This is a great little trick to manage your digital cravings when it’s time to enter Holiday Mode. 4. Delete apps that aren’t absolutely necessary: Make it difficult for yourself to get lost in the black hole of app browsing by deleting them right off of your device during Holiday Mode time. If they aren’t absolutely necessary (for work, for example), you can do without them. If you really want to check Facebook or Instagram you have to go the long way and use the browser to access your social sites. Consider this like taking the stairs to your favourite guilty indulgence: if you want it, you’re going to have to work for it. This will make it less likely that you’ll cave in. 5. Turn it into a game: Find creative ways to make a game out of unplugging, like getting everyone at the table to stack their phones in the middle of the table during dinner; the first to check their phone has to pick up the tab or do the dishes Create a designated “Phone Box” for social gatherings. When your family or friends come over let this Phone Box play host for everyone’s smartphones so your attention can be spent on the people around you. 6. Out of sight out of mind: Stash your phone – somewhere safe – but in a hard to reach place while you’re in Holiday Mode. Keeping it out of your reach and sight will help curb the convenience of a quick text or newsfeed scroll. 7. Switch into auto pilot: Let your device do the work for you: set auto-response notifications for your texts and emails. Or, slide it into airplane mode to hold all communication while you’re in Holiday Mode. You’ll be pleasantly surprised how quickly you forget about your phone, especially while you’re with friends and family enjoying some egg nog. And don’t worry, all of your messages will be there waiting when you when you’re ready to connect again. 8. Set expectations with your close friends and family: Last but certainly not least, make sure to tell close friends and family that you will be putting down your device and going into Holiday Mode for a while so in case of emergency, to reach you on a land line (yes, they still exist!). That way you won’t be stressed that you are missing something urgent, and they’ll know how to reach you if they need you. I already do her #3 tip when I go on vacation. I turn off the notifications in all my Facebook groups so my inbox doesn’t fill up. I also get notified when I get new Pinterest followers so that notification will also be turned off till after the holidays. That should free up my inbox quite a bit! I love her idea for a designated Phone Box. We’ll have to put that one to use on Christmas day when the family gets together. Hopefully the rest of my family is on board for getting into Holiday Mode. I think they won’t be too hard to convince! How do you plan to enter Holiday Mode? I’d love to hear your tips! Connect with TELUS on Twitter. It will be hard to not have the phone with me during the Holidays because family members contact me and talk to me because they can not be with me on Christmas this year. I will try to unplug a lot during the Holidays because focusing on family is more important than always looking at email and phones! This is an incredibly useful article both for myself and my hubby. He has an incredibly stressful job and I have to remind him to step away from his phone. But I am bad for “watching” TV with him and being on my iPad too. So I am going to print this out to remind both of us to unplug. Thanks! It’s extremely difficult to disconnect but I think it’s awesome that Telus is reminding people to focus on things most important. Focusing on what is important is essential, however my phone is essential to reaching out to my family on the holidays. However, I will probably deconnect from facebook etc a few days over the holidays. those are some good ideas.but i dont have to worry about it.my phone isnt a smartphone just a plain old phone and i dont have a tablet and i have no problem shutting off my computer. I’ve begun using Twitter and I am starting to get addicted. I plan on checking my account less often and spending time with my son who is home on college break (when he’s not checking his social media accounts!). We do some of both. We have our family time my husband, daughter, and I with all of us together watching movies and bonding. We also have the phone calls and Skype to other family members. It’s important to find a balance, and I’m glad people are turning to each other and away from electronics. During the holidays it is all about family and friends for us. Creating new memories, sharing, and just being together. We do a lot to unplug. We know how important it is. I don’t use a mobile phone, just the computer but I will be so busy on Christmas day to use it. Probably evening I will find time. Can turn off for a little while but thats it. I enter Holiday Mode by turning all disruptive devices off. Just turn off the computer and the cell phone, it’s that easy. If it’s hard for you, just keep reminding yourself that it’s just for one day or for a few days. When I unplug the thing that I dread is having my email pile up. Really important points. I will be forwarding this to my hubby to encourage him to unplug for awhile and enjoy. I agree unplugging is really important. I don’t really use a cell phone but I’m addicted to my iPad for surfing, watching, and email. Hubby is always tinkering with his phone and is guilty of “watching” TV/movies with it attached to his hand. The most annoying is when he asks us what happened in the show/movie and/or rewinds.